What fires are most common to restore? Kitchen fires are the most common fire cleanup jobs we restore in Melbourne, FL. Grease fires and unwatched food are the main culprits when it comes to fire damage cleanup. Call SERVPRO of South Brevard for all your fire damage needs. 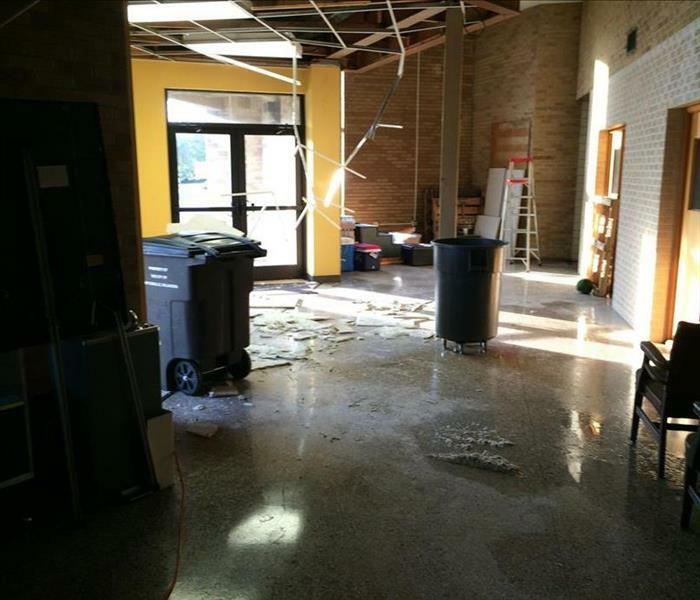 The bathroom flooded overnight causing a big mess for the facility manager of this building. SERVPRO of South Brevard was able to have the building cleaned and drying in just a few hours. The job finished drying in just three days. We pride ourselves in being faster to any size disaster. When the business owner called us we were able to be onsite and cleaning within hours. Our technicians had the standing water extracted and building drying before the night was done. Storm damage is hard to clean at times because of all the damage that can occur. The roof of this building needed to have emergency tarps placed to keep out the elements. Once in place we were able to begin the cleanup and drying process of the Melbourne Home. 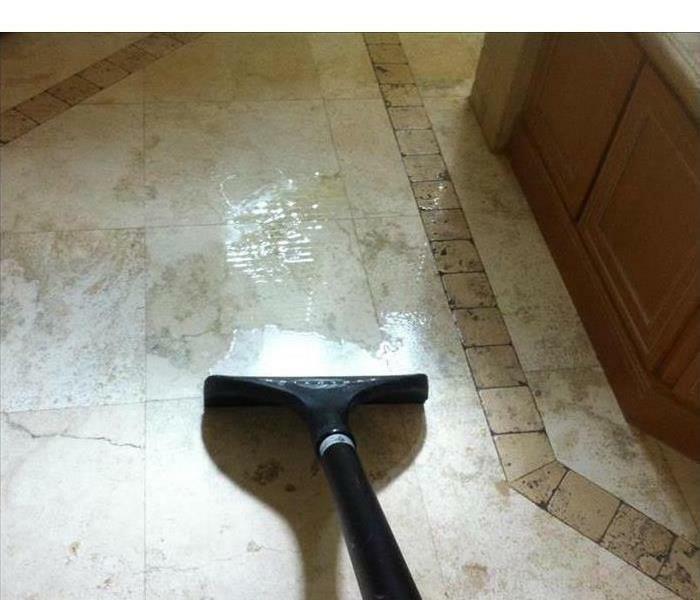 SERVPRO of South Brevard understands that the fastest way to remove water is through extraction. Using a high powered extraction wand allows us to get rid of standing water on tile and on carpet. When a storm hits Melbourne many homes can be damaged. Why do we remove material after a flood or storm? Bacteria and contaminates from the outside are not good to be in your home. The bacteria will begin to grow and be more difficult to disinfect over time. When your home needs to look its best call SERVPRO of South Brevard to have your carpets cleaned. 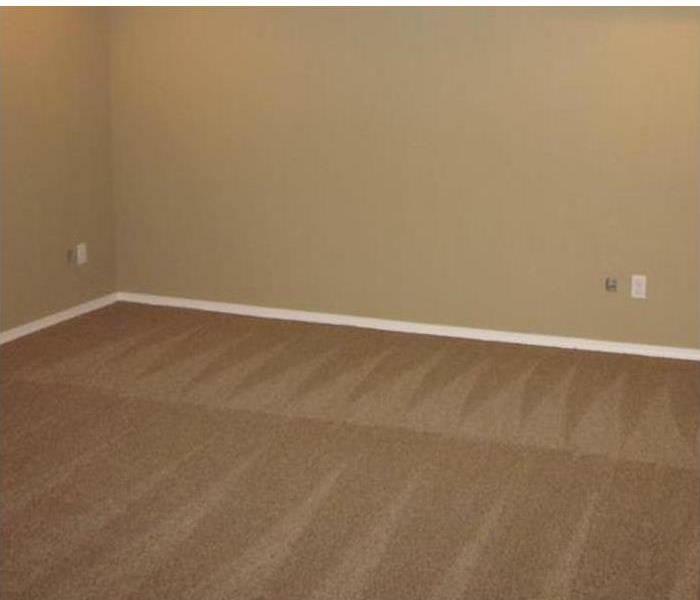 Have us clean your carpets for any occasion or annually to keep them looking their best. We at SERVPRO of South Brevard use the right equipment for the job. This home had a water loss and we arrived with an extractor to remove the water from the home. 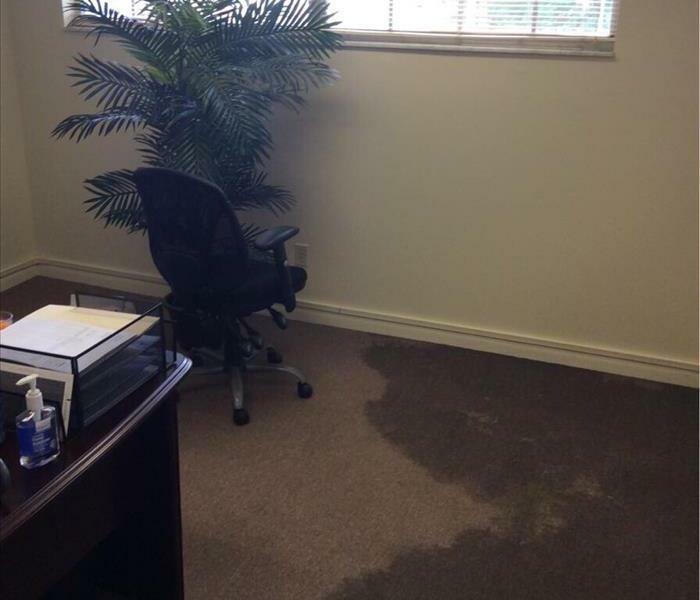 Call us for all your water damage needs (321) 777-5131. Learn more by reading our blog. Training day for our employees at SERVPRO of South Brevard. Training is very important to us to keep our mold and cleaning certifications. Learn more about our mold certifications by reading a blog about mold damage. These wonderful customers of the Christense Family was an absolute delight to service. They unexpectedly had a pipe burst at there Palm Bay home and call our Emergency Hot Line. We were able to assist them within a hour and within days there home was back to normal! The owners couldn't believe how quickly we made their home look "Like it never even happened". This is the letter we received in the mail several days later. Thanks to the Christense Family for such kind words!! This Indian Harbor Beach home was affected by a Florida thunderstorm this past July. 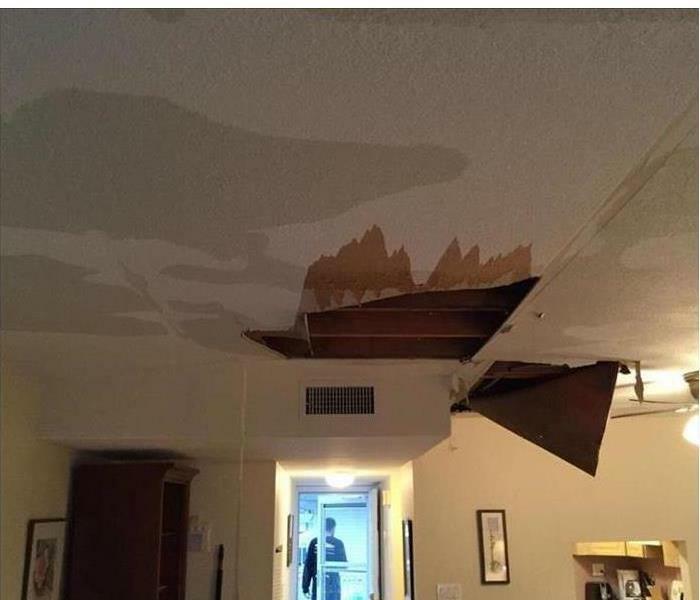 The roof was affected by the storm and cause a roof leak, which seeped through to the ceiling drywall. 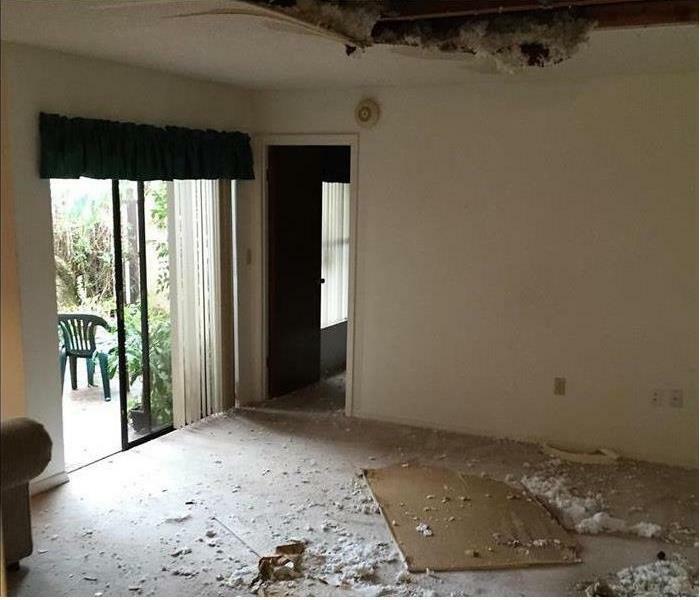 The homeowners called SERVPRO of South Brevard, and our crew came out and tore out the affected ceiling. Since the attic was still damp, the technicians placed several air movers to dry it out. Once dried, our SERVPRO construction team was able to come and replace the ceiling. The homeowner was so pleased that SERVPRO of South Brevard could take care of the entire job including both mitigation and construction. This Melbourne commercial building suffered serious damage after a pipe burst over the weekend. The entire building consisted of two to three inches of standing water. 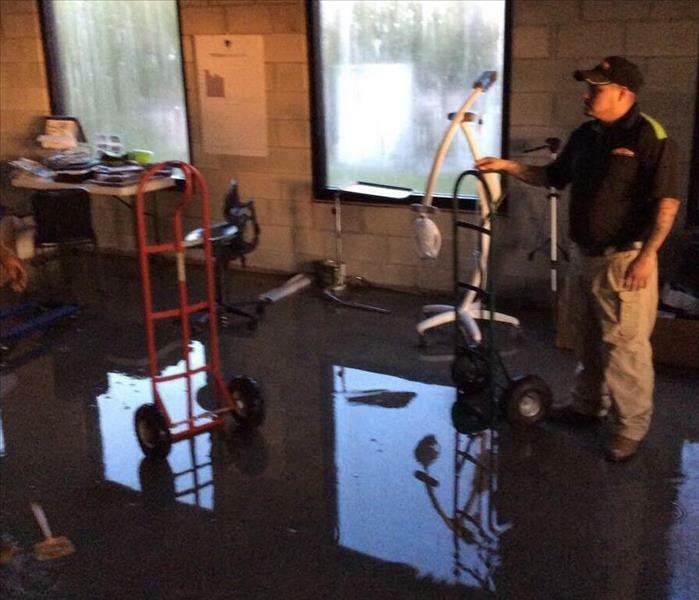 This was the aftermath of the water damage in the storage room of the building. 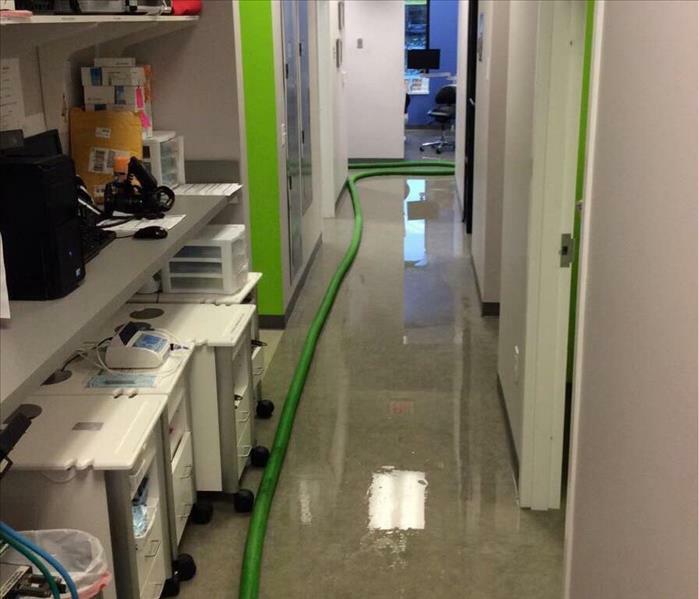 We know that commercial water damage can cost a business thousands of dollars in productivity; it is always our goal to get you back up and running as quickly and seamlessly as possible. Because this building owner knew this, they called SERVPRO of South Brevard. This was the aftermath of a house fire that affected everything in the Satellite Beach home. The fire started in the kitchen when the homeowners was cooking dinner on the stove. Because the homeowner had a lot of items on the counters and all throughout the home, the fire quickly jumped from item to item. When the fire was finally put out, there was a significant amount of fire, smoke and soot damage. 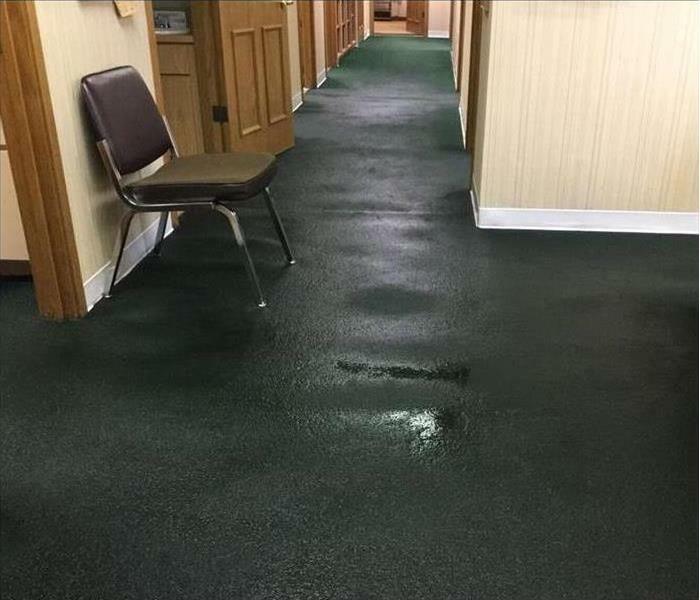 This office building in Micco, Florida suffered a water loss that halted business. The loss was due to a hot water heater that leaking throughout the night. When employee came into work the next morning, they found soaking wet carpets in different offices, lobby, kitchen and storage unit. they knew they need to call their local experts to get out there quickly, start work, and get the business up and running again. And that's what SERVPRO of South Brevard did! In three days the business was back and it looked "Like it never even happened." 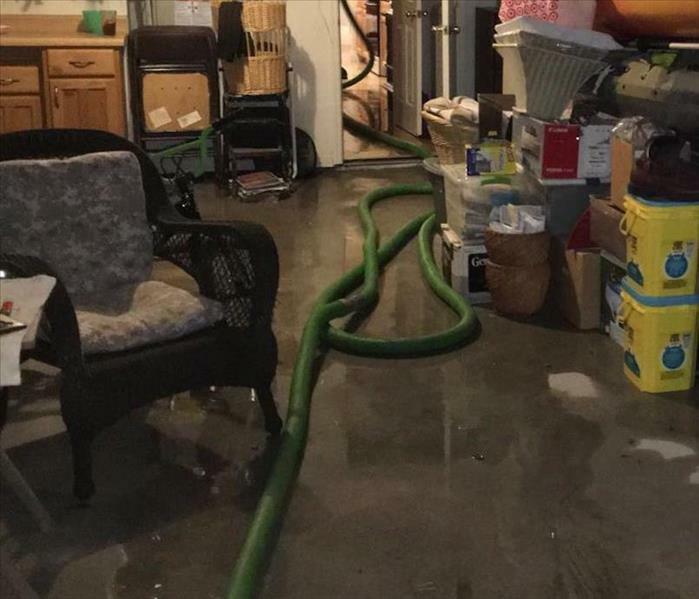 These Melbourne Beach residence suffer from rain water entering their garage and parts of their home due to a large Florida thunderstorm. When we arrived to the property this was the aftermath of the storm in their garage. All the items close to the floor of the garage was affect by the rain water and needed to sorted and determined to its salvageable or not. Our technicians at SERVPRO of South Brevard work though the night to get this Melbourne Beach home dried. The family was very grateful that we were able to recover their home a few days later. This Palm Bay family suffered from a large water damage through their home. The water loss was caused by a defective hot water heater. This was the aftermath of the hot water heater leaking in Palm Bay, which you can see. the laminate flooring was affected and when our technicians were pulling up the laminate there was water underneath. To properly dry-out this residence we have to remove all the laminate and extract the remaining water and place fan movers through the affected areas. SERVPRO of South Brevard worked hard and diligently all today to get this Palm Bay home to its preloss conditions. 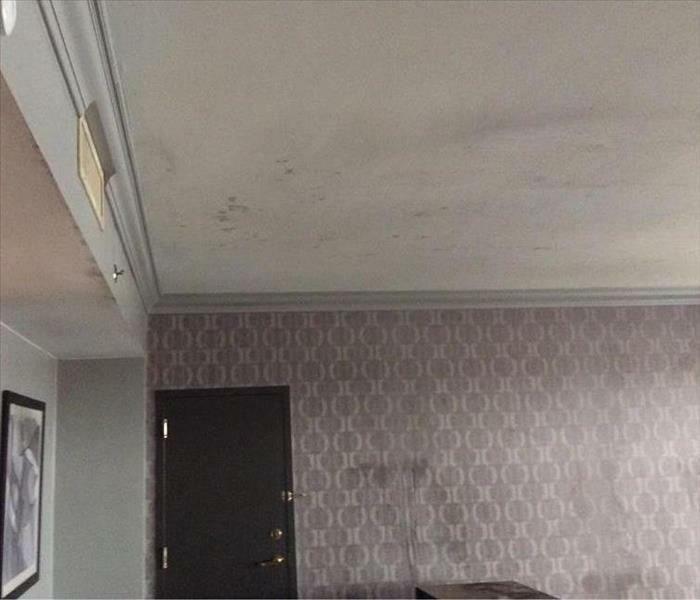 This Melbourne commercial building experienced a large amount of water spraying all throughout the building when a customer hung something on a fire sprinkler causing it to activate. There was a significant amount of water on the ceiling, walls, furniture, and carpets. We were able to respond quickly to the location because we are locally owned and operated. 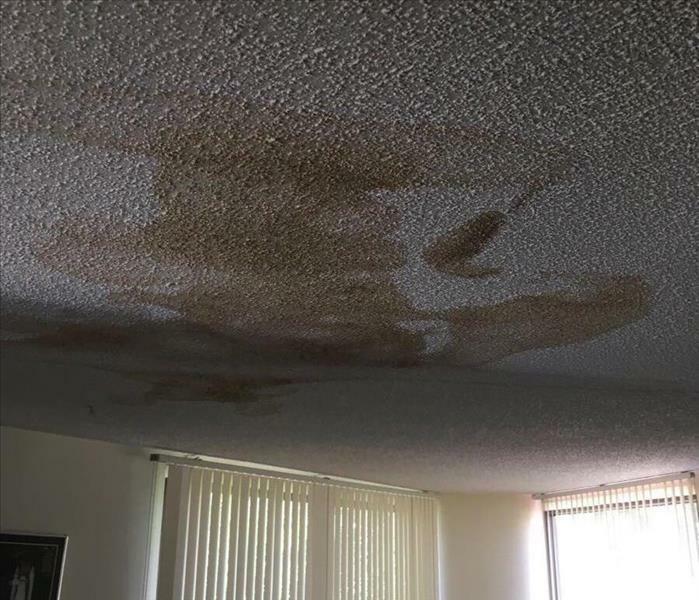 This Melbourne Commercial Building suffered a roof leak during a Florida Thunderstorm this summer. 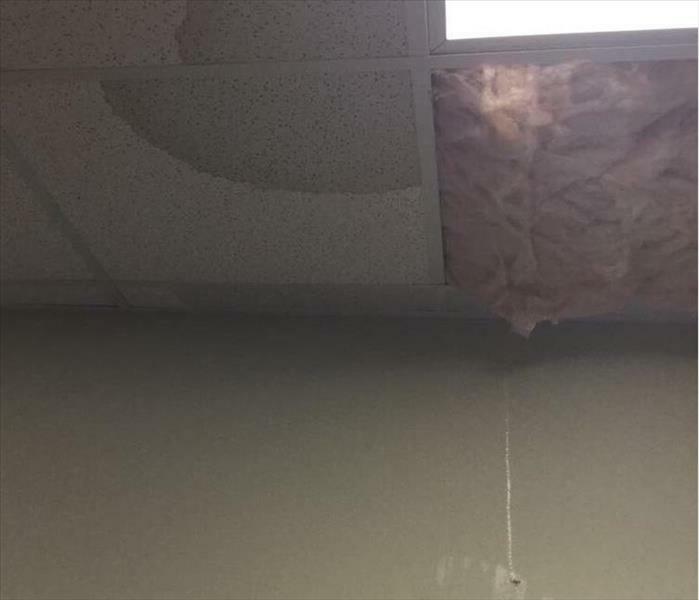 The roof leak allowed the water enter the roof which seeped through the ceiling tile. Ultimately, the water leaked all over the office desks below and on the floor. This water leak through the roof lasted all night and cause several office floors to have water damage. 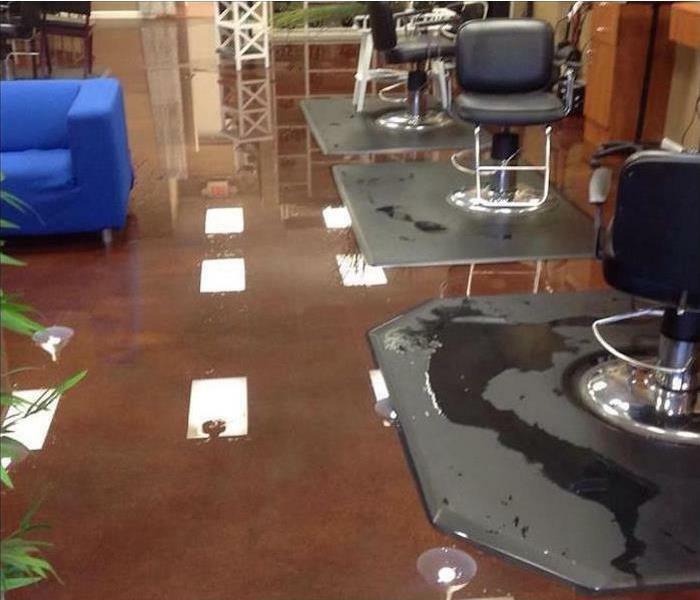 If your business has been damaged by severe floods or storms, call us right away at 321-777-5131. Disaster can strike when we least expect it, but SERVPRO of South Brevard will be there to help you weather the storm. 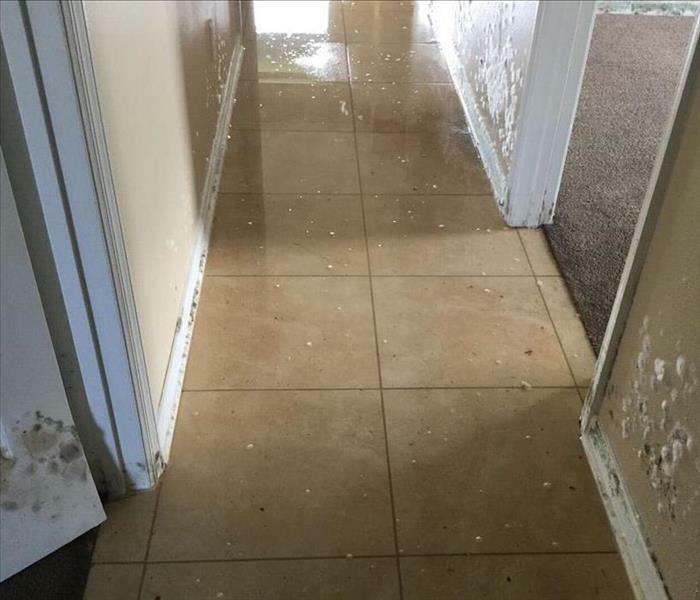 This was a Melbourne home that had a large water damage incident while they were away on vacation. As you can see there is a significant amount of mold on the drywall and baseboards which was a result of the standing water setting there for more than 48 hours. When our certified technicians arrived on site, the first step was to remove the water in the home. We do this procedure with our state of the art water extraction tool called the extraction wand. This family's Merritt Island residence suffer sever damages when a Florida thunderstorm ran through Brevard County. The large hole in the roof was cause by a lightning strike that resulted in the a fire and the collapsing of the entire roof in their home office. The aftermath of the lightning strike caused damaged all throughout the house due to rainfall, the fire and the fire department trying to put of the fire. Storm damage and lightning strike cannot be predicted, in order to be prepare be sure you know who to call to come to the rescue and help you make your home look "Like it never even happened." This West Melbourne office building suffered serious water damage from the hot water heater that broke some time during the night. When the staff arrived the next morning, they were greeted by an inch of water through out the entire building. Since we are locally owned and operated, we are able to respond quicker with the right resources, which is extremely important for business. Early in the morning, this Melbourne family found their laundry room on fire. This was the aftermath of the family's washer and dryer when we arrived to this Brevard County residence. Not only was the area that was immediately around the laundry room affected, but the entire home had significant smoke and soot damage. This also include all the family's' furniture and possessions. Luckily, the homeowner call his local restoration team, SERVPRO of South Brevard, and we were able to use our fire restoration process to restore many our the family's possessions and furniture items. If your even experience smoke or soot damage to your home or items, remember our fire certified technicians are able to restore your damaged items and make it look "Like it never even happened." This was the aftermath of a house fire in Satellite Beach that was caused by fireworks landing on the roof and entering the home. This immediately caused the entire home to light up in flames. Not only was there a large hole in the roof allowing outside elements to enter the home, but there was a significant amount of fire and smoke damage throughout every square inch of the house. 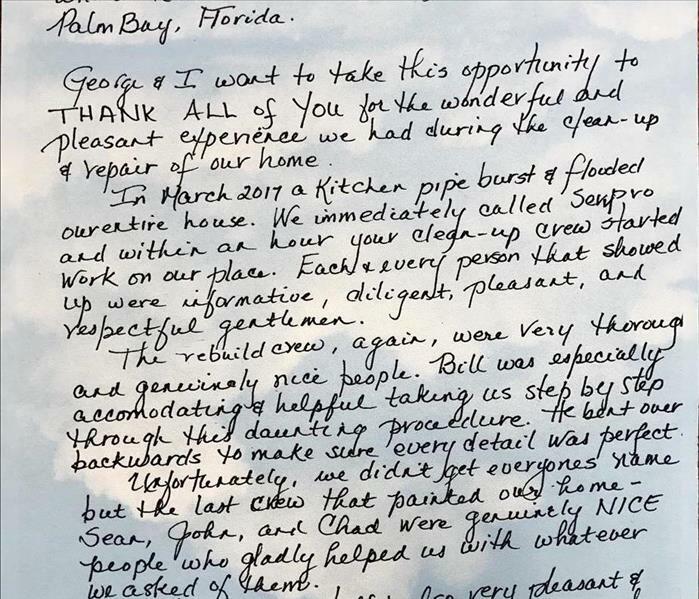 Since SERVPRO of South Brevard focuses on restoration verse replacement, our crew was able to salvage and clean some of the beach side homeowner's possessions. If a tragic incident, like this house fire, even happens to you and your home, don't immediately count it as a total lose. Call your local restoration technicians at SERVPRO of South Brevard, and allow us the opportunity to salvage some our your possessions. Grease fires can be very dangerous and can affect more than just right above your stove. This Melbourne resident experienced a grease fire and it affected the entire house especially the kitchen area. The smoke from the fire stuck to all the cabinets, ceiling, drywall and tile in the kitchen. 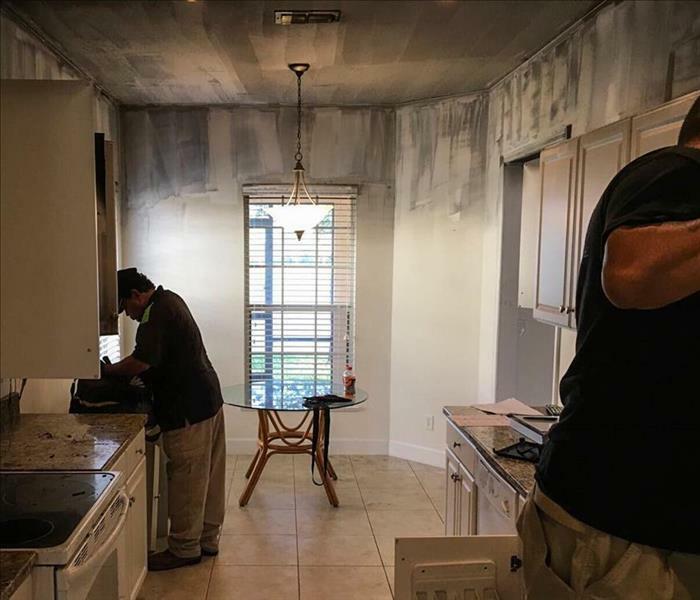 There is a particular technique SERVPRO of South Brevard performs to remove smoke damage from drywall and tile that in most cases allows us to restore the affected areas rather than replace everything. 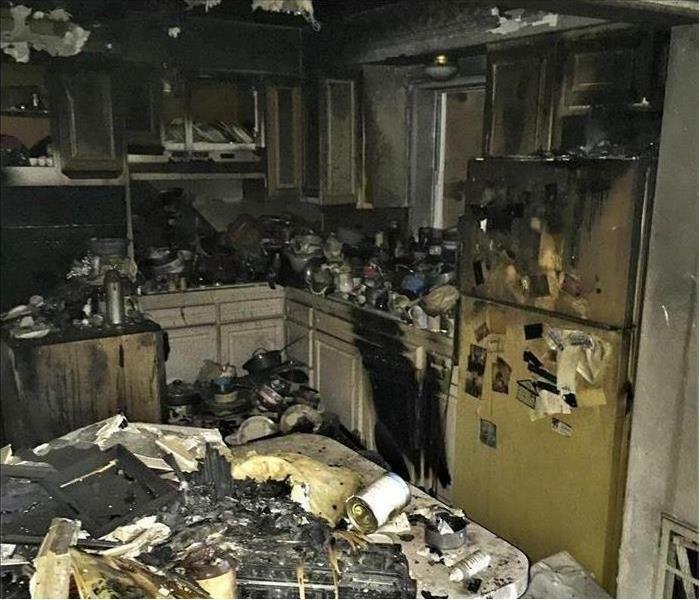 If your experience a grease fire or kitchen fire and have smoke damage, hire your local SERVPRO of South Brevard and we can make your home look "Like it never even happened." Satellite Beach residents came home from vacation to a house that was completely damaged. While they were away a pipe burst and flooded the entire house. 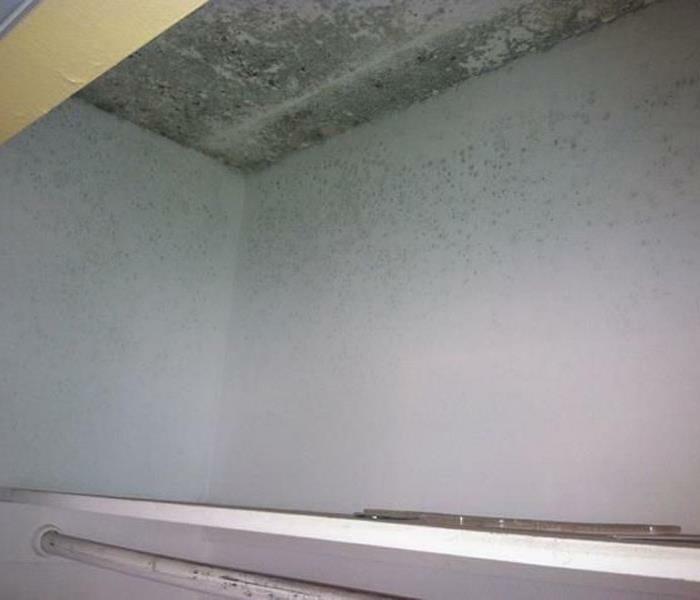 With Florida weather always so hot and humidity high, mold start to form within 48 to 72 hours after the incident occurred. Always remember to turn off your water before leaving for vacation to avoid this happening to your home. Melbourne mold damage detection is aided by the use of this specialized device. 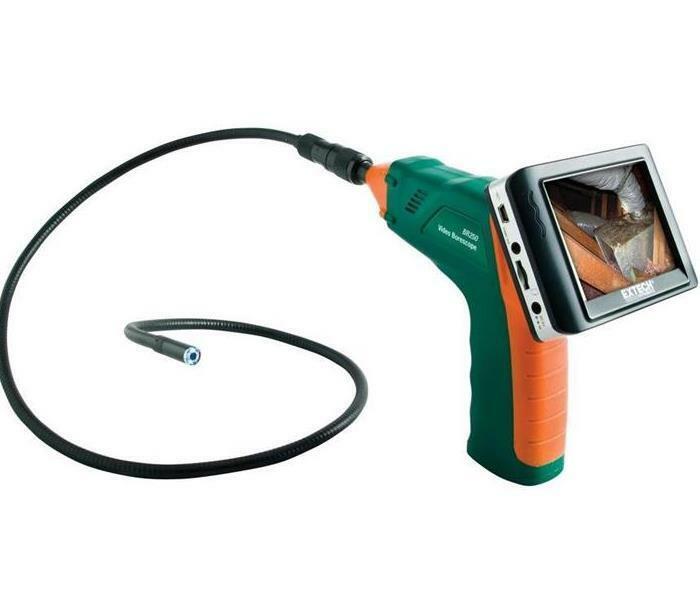 Borescope cameras are very useful in determining water or mold damage in difficult to reach areas. Defining the precise area that has suffered damage not only lowers the cost of restoration, but it also puts families back in their homes faster. 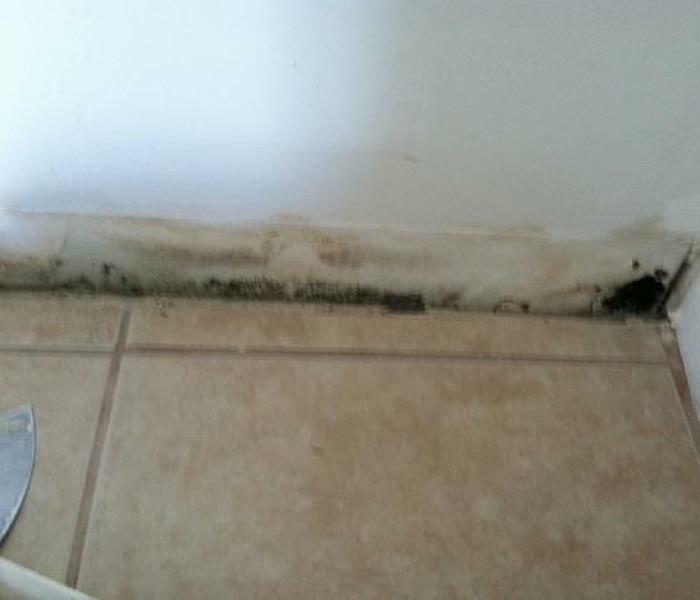 If you suspect mold in your dwelling, call SERVPRO of South Brevard 24/7 at (321) 777-5131. We will use the latest technology for mold remediation. 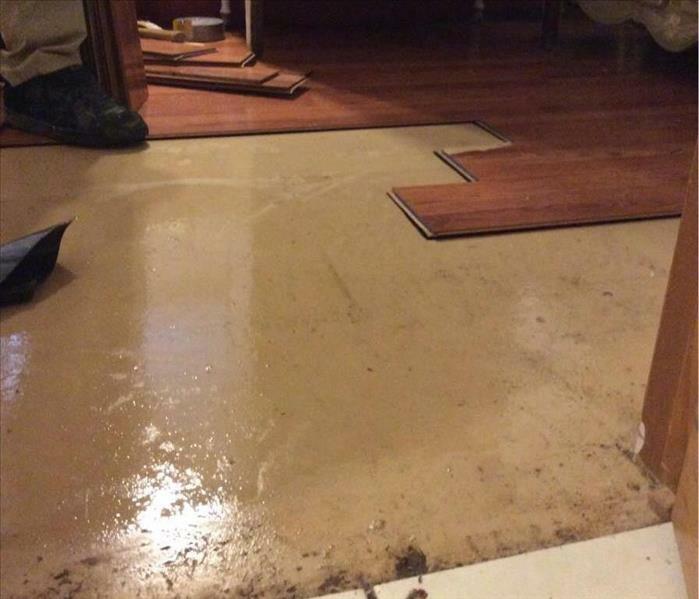 After this home suffered damage from flooding the carpet needed to be removed and replaced. Drying was a big part of the process in order to prevent mold damage. SERVPRO of South Brevard proudly serves Melbourne, Melbourne Village, Palm Bay, Port Malabar, Satellite Beach, Indian Harbor Beach, Indialantic, Melbourne Beach, Sebastian, Grant-Valkaria, and surrounding areas. We are available 24 hours/7 days a week and are ready to restore damage. 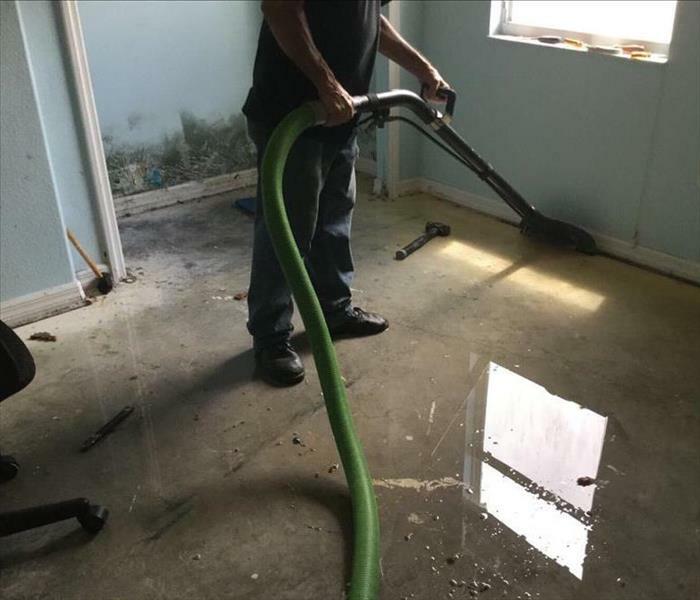 SERVPRO of West Brevard is a 24/7 emergency water removal & flood clean up repair service company, Our technicians are highly trained and experienced with every water damage situation from sewage damage clean up, mold removal, smoke damage repair, fire damage repair, flooded basement, wet carpet, wet walls, carpet water damage, basement water damage, flooded crawl space, sewer backup, sewage removal, mud removal, commercial water damage, restoration, house water damage, building water damage, hotel water damage, flooded building. This commercial building had most of their ceiling fall after extensive water damage from a leak in the roof. SERVPRO of South Brevard Professionals concentrate on safely drying, deodorizing and disinfecting the areas flooded or damaged by water damage, water stain wall, water removal tool Melbourne, basement floor cleaner, Palm Bay water removal services, water removal companies, humidity problems, ceiling repair water damage, water removal tools, water damaged wall, water damage walls, water stain floor, home water damage repair, flood water damage Port Malabar, drying equipment, water damaged carpet, basement water problem, Satellite Beach water restoration, water damage basement. Mold Damage was found behind the baseboards in this Melbourne home. The homeowners called SERVPRO of South Brevard to remove the mold damage. SERVPRO of South Brevard removed all of the affected drywall and completed mold remediation. Mold can spread throughout a property in as little as 48-72 hours, and can produce allergens and irritants that have the potential to cause other health effects. If you suspect that your home or business has a mold problem, SERVPRO of South Brevard professionals can inspect and assess your property. If mold is found, they have the training, equipment, and expertise to handle the situation. 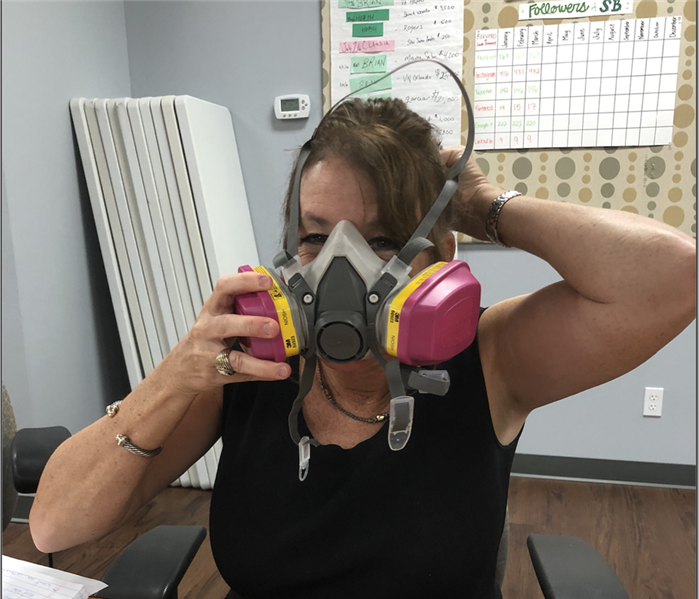 SERVPRO teaches IICRC technical classes in the proper removal of odors. Masking and other short cuts don't work when your odor problem is serious or persistent. A professional has the training and equipment to identify and eliminate these offensive odors.